4 Fb 2 2nd fretfr. 2 Db 3 2nd fretfr. Chord Bbdim notes: Bb, Fb, Bb, Db and Fb. (Fb=E). The string 1 (Fb) is left open. 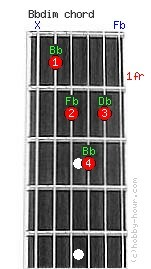 Bb(A#)dim - Bb(A#) diminished triad guitar chord's alternative names: Bb°, Bb-5, Bbm-5, and Bbdim. See also: Bbdim7 and Bbm7b5.